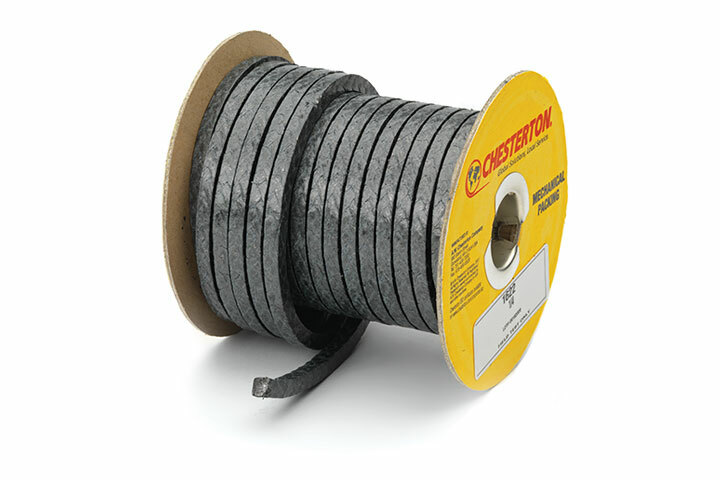 Chesterton 1622 Low Emissions Reinforced Graphite Packing - BBC Pump and Equipment Company, Inc.
Block valve fugitive emissions are effectively reduced to below consent decree requirements with this high performance valve stem packing from AW Chesterton. Constructed from an Inconel reinforced graphite, 1622 is a non-hardening, flexible packing that will not shrink or absorb moisture. Provided as a single spool solution, 1622 is easy to install and can be used to standardize your block valve stem packings, thereby reducing inventories and installation errors caused by selecting the wrong packing. 1622 has received the National Pollution Prevention Roundtable’s 2010 Most Valuable Pollution Prevention (MVP2) award and Chemical Processing Magazine's 2011 Vaaler Award for 1622’s emissions reduction capability. 1622 packing be used in a variety of applications to seal light and heavy hydrocarbons, VOC’s, VHAP’s, steam and most non-oxidizing chemicals in Hydrocarbon Processing, Petrochemical and Chemical Industries.